We all know that dehydration can be fatal to our dogs, but now we are learning that too much water intake is equally dangerous! But these activities all have one potential danger – our dogs may inadvertently ingest a large volume of water. When there is too much water in the body fluids, sodium levels outside the body cells become significantly depleted (a condition known as “hyponatremia”). In order to rebalance itself, the body increases fluid intake inside the cells. As a result, the cells are “swollen” with fluid, making them bigger in size. As you know, the brain is encased inside the hard skull, if the brain cells are swollen with fluid, there is no room for the brain to expand, this causes an increase in the intracranial pressure and a lot of damage to the brain. So does that mean we shouldn’t allow our dogs to play in the water? Also, we should learn different ways to prevent this from happening in the first place! 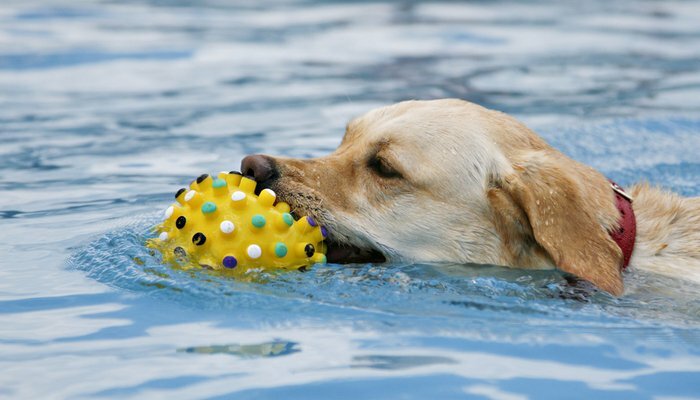 If your dog has is diving, retrieving, and playing in the water make sure that they have frequent breaks. If you suspect that your dog has consumed too much water take him to the vet right away. Wokette and Bouboule are adopted! Today we have good news. 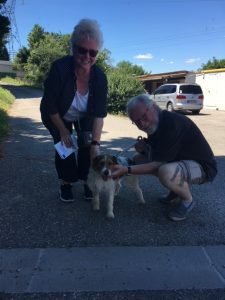 First of all, little Wokette was adopted yesterday at the open day and today another great little dog Bouboule, was adopted. 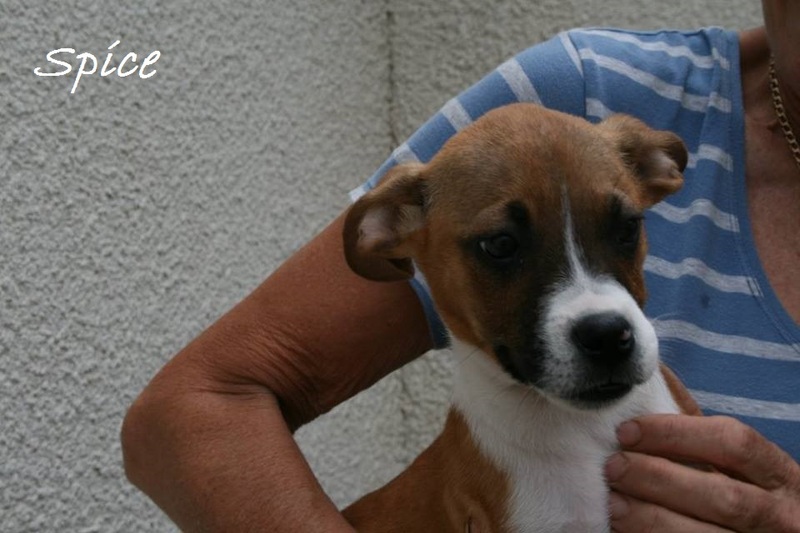 When Wokette arrived a few weeks ago we knew that she wouldn’t have a long wait. 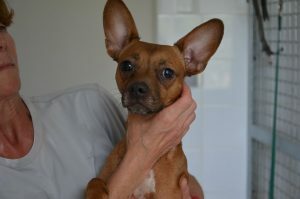 She was a small breed female French Bulldog cross and was very cute! Its great that she has a family as the temperatures in kennels are horrific at the moment and brachycephalic dogs are really at risk. 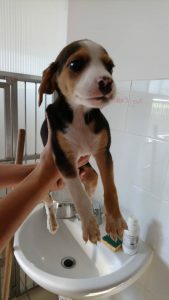 We hope that today instead of panting and puffing in the refuge she if lying in the cool of her new home. 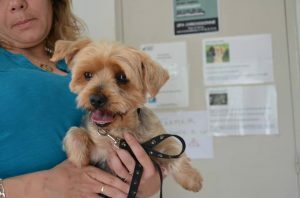 Todays adoption was that of Bouboule, another smashing little dog. Bouboule was 11 years old and also at risk from the heat. 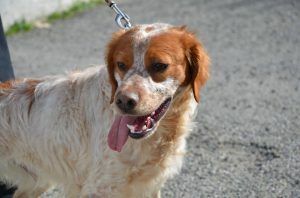 He has been very lucky not to have too long a wait and we hope that he too will be enjoying the cool of his new home. Social media is full of stories of dogs overheating and dying in the heat in both the UK and France. I cant stress too much how dangerous vigorous exercise is for dogs, young and old in this extreme heat. Please do not take any chances. Exercise your dogs very early mornings or very late at night. Its better that they even miss a walk than die of heat exhaustion. If you are lucky enough to have a pool which you don’t mind your dog in, it’s a great way to exercise them and keep them cool. Rivers, lakes and even paddling pools are just as good. It goes without saying that dogs in hot cars are at risk. Unless you have good aircon don’t risk it unless you set off very early or late. So please keep your doggies inside during the heat of the day to keep them safe and cool. Goldy is adopted and Huguette finds a foster. Good news from the ScPA tonight. 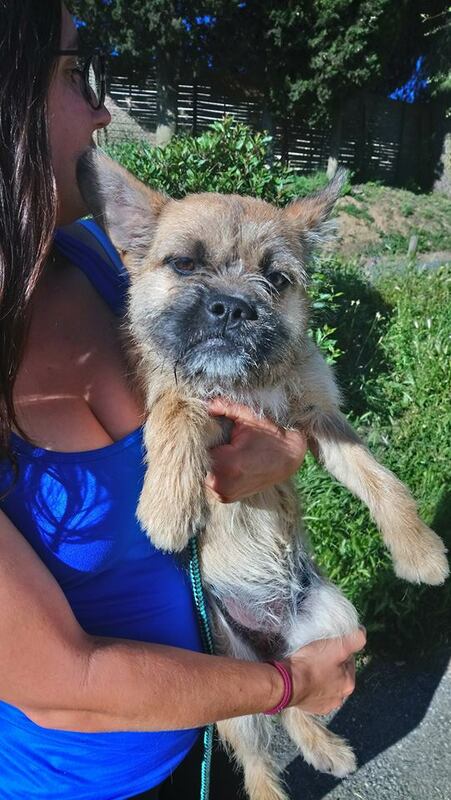 First off Tuesday’s beautiful cairn terrier arrival, Bonnie (in real life Canelle), was reclaimed. She arrived unidentified, except according to her owner this was not the case. This time it was not a case of a microchip having moved or becoming de-activated. Canelle was actually tattooed as a puppy. Except that the skin on her inner thigh is black and so is tattoo ink. Oops. It is worth thinking about whether or not your dog’s identification will do its job, ie reunite you with your dog should he or she go missing. 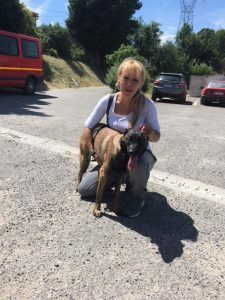 In this instance Canelle and her owners were lucky that the person who found this wonderful pedigree brought her into the refuge, otherwise she could have been lost to them forever. We then had the first of our leavers. Prue and her daughter were looking for a companion for their dog, and Goldy caught their eye. 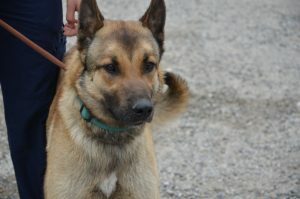 This young malinois has been at the refuge since the end of March. 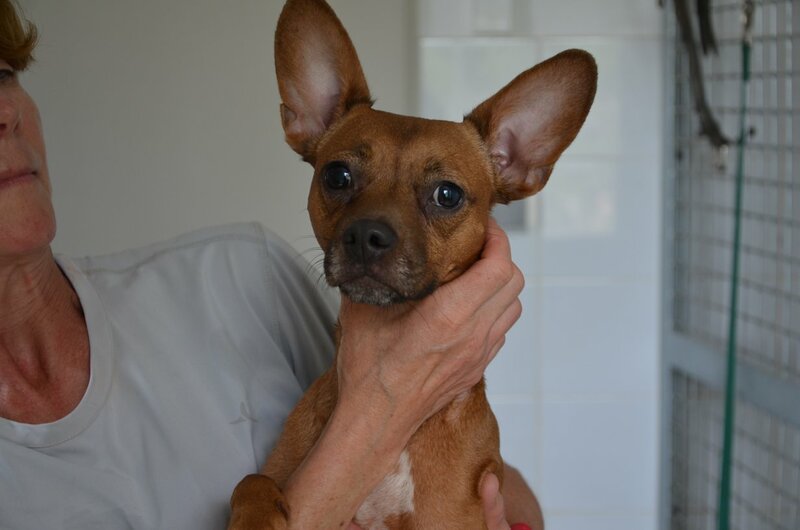 We are not sure of her past, but she has a deformed jaw, presumably due to having had a bit of a wack when she was a puppy. Just as well she came to the ScPA, then. Since she has been with us she has been the adored favourite of volunteers Catherine and particularly her daughter Amelia. They have walked Goldy religiously and done a huge amount to aid her confidence in people. They were unable to adopt her, however, as Goldy is not at all good with cats. 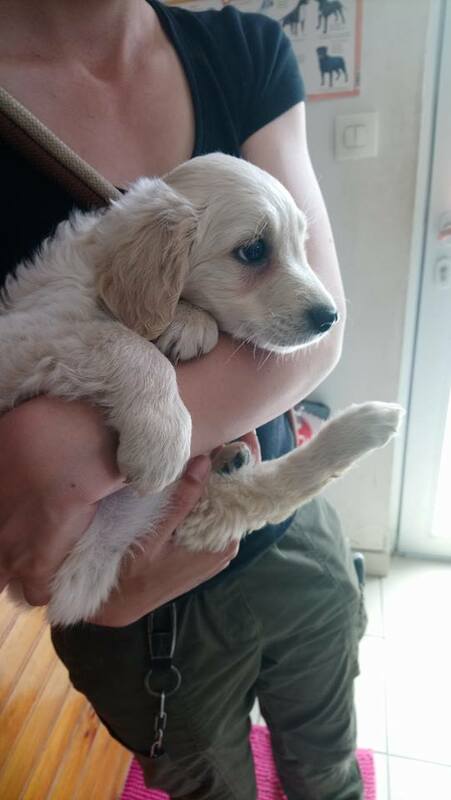 However we all agree that if you can’t adopt a dog yourself, the next best thing is that he or she finds a wonderful home, and that is what Goldy now has. We look forward to news and photos. Today’s second leaver is one we are particularly happy about. At the ScPA on Tuesday we were a bit worried about Huguette. This elderly hunt-type dog arrived in early June, apparently with the weight of the world on her shoulders. She had obviously had numerous litters and is not in the best physical shape. She was also covered in ticks and fleas and just seemed exhausted. She was finding refuge life hot and uncomfortable and was not eating well. It was sad to see her just hiding away and refusing to go even for short walks. So we put out a quick appeal, and immediately Lesley got in touch to ask if she could come to visit Huguette with a view to taking her into long term foster. Everything was crossed when Huguette went to meet the cats yesterday (many thanks to the staff for their help), and then today when Lesley and her husband came to introduce Huguette to their own dog, Pam. Who would have thought a mere 48 hours ago that Huguette would now be lying under a shady tree, free to roam around the couple’s huge garden and with everything an elderly dog could desire for what we hope is a long and happy retirement. Many thanks to Lesley and her husband. I know several people who will sleep better tonight knowing that Huguette, (aka Sam) is with you. Today, after a couple of days’ hiatus, we had two adoptions! First to leave was Ninja. This wonderful malinois cross was brought to the refuge as a stray in April. Unlike many dogs of this breed, Ninja was relatively uncomplicated. He shared his box from virtually day one, and was very popular with staff and volunteers alike. He is a young dog, arriving at the age of some 18 months, and so he has his whole life in front of him. However with nigh on 100 dogs at the refuge (yes, numbers are picking up now that summer is approaching), how to choose? Well, Ninja’s new family have reflected long and hard before adopting him. They have been along to the SPA on several occasions to walk him and to introduce him to all the family members including, today, their dog. Ninja was good as gold, and tonight he is in his new home. Many thanks to his new owners and we look forward to news and photos in due course. Today’s second adoption was that of puppy Angelo. 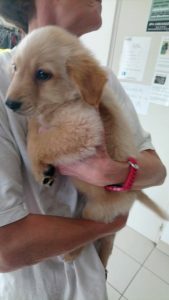 Yes, there have been many puppy arrivals recently, and so we are delighted that at least one of them has found a home so soon. Angelo’s new family was looking for a young, active dog and to be honest, you can’t go wrong with a puppy, especially one that appears to have some Breton spaniel in the mix. But who knows, perhaps looks can be deceptive…Yes, we have the results back of the DNA test that we carried out on puppy Spice! Watch this space, all will be revealed! We were all devastated when Jack was returned in March, after a few months in his new home. This wasn’t his fault, just the older lady who adopted him had not accounted for a 10 year old being so lively and energetic. Until a few weeks ago there had been no interest shown in him since his return, I guess because he is an older black dog. But that didn’t stop him catching the eye of a couple well used to rescue dogs and their complexities! They had been following him on our website and were attracted by his breed and size. 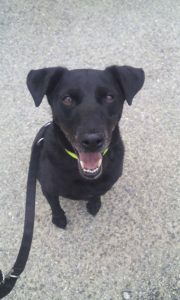 Jack is a Jagd terrier x Labrador and as they already have a female Jagd terrier, they love the breed. They also have a very mellow pointer who is very accepting so were quite prepared to do careful introductions and give the dogs time to adjust and find their place. Although Jack had already been sharing his kennel and play park with another male called Bang we would normally have asked the adopters to come to the refuge with their dogs, so we could oversee the introductions and see for ourselves how the dogs were together. However, this wasn’t possible so what should we do? Should we just say no or should we transport Jack and trust the adopters to do sensible introductions? With the former, Jack doesn’t get his chance, with the latter there is a risk that the dogs don’t get on together. As the adopters were realistic and experienced we chose the latter! So, this morning I was at the refuge for opening time and drive him to Montauban to meet his new Mum and Dad. Human introductions went well and off he went to meet his new doggie family. Time will tell how things are going to work out for Jack, but we all have our fingers crossed! 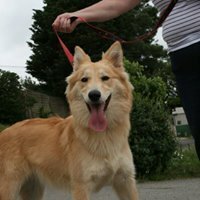 Due to owners illness, we are looking for a home for 3 year old Google, a Bruna de Jura x.
Google has lived in a family home with other dogs and cats. He is house and crate trained. 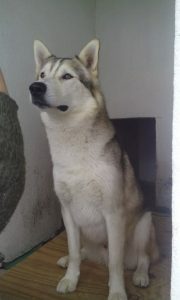 He has a lovely sweet nature and is good on the lead but will meed an enclosed garden. 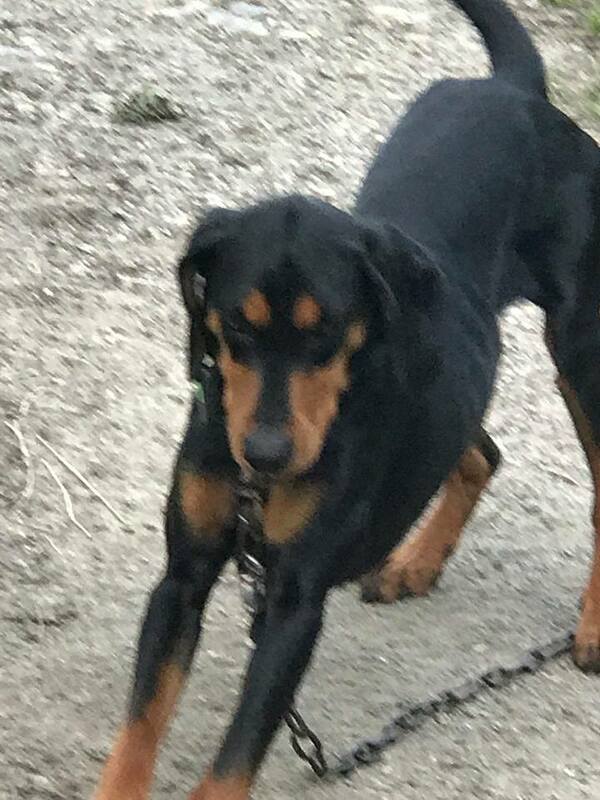 The owner would love him to be in a family where he got lots of 1 to 1 attention and being a young boy, he will need an active home. At only 14kg he is medium sized. He is microchipped, vaccinated and castrated. Adoption of Lascar and Gribouille. Two weeks ago, Lascar arrived at the refuge and we all thought that he was extremely lucky to leave the same day. Unfortunately, he came back the very next day because the family cat did not like him. Abandoned twice in as many days is never good for any dog’s moral. Lascar settled into refuge life, happily sharing his kennel and I bet he was wondering what on earth was going to happen next. Luckliy Jessica, a young lady from Chamonix read Lascars story and thought that he was just what she was looking for. Not many adopters contact us to say that they want an active young male dog! However, the dog did need to be able to get along with cats as her mum does have both cats and a dog and when visiting the UK all the animals need to be able to live in harmony! 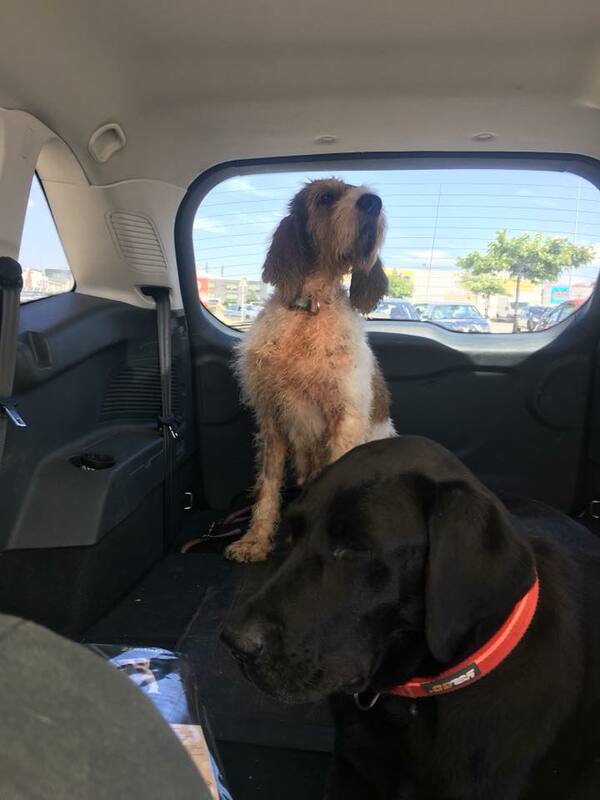 Lascar was reserved, and it was an early start for Jessica and friend this morning as they began their long drive to collect him. 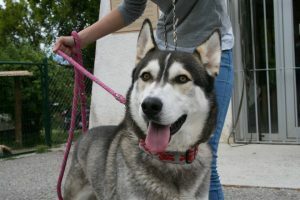 It will be another stressful day or so for Lascar as he travels back to the Alps but then he will be in husky paradise. 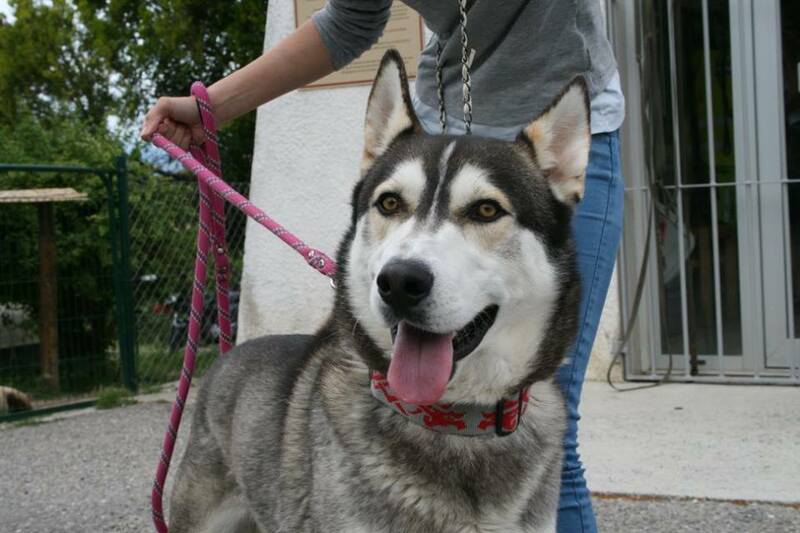 Jessica has a well enclosed garden for him and leads a very active life in hills…just what a young husky needs! How I wish that it had been so easy for four year husky old Texas. 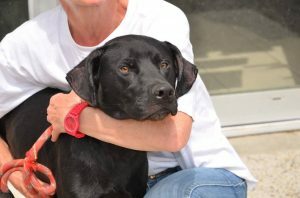 Texas was adopted and brought back as his cat hunting hobby were causing mayhem where he lived. Strangely enough Texas did grow up with a cat but like many dogs, he just got on with his cat! So, we are looking for an active family with a well enclosed garden and without cats for Texas. If you think that you could offer lovely Texas a home, then do get in touch. Texas is desperate for a home! The second adoption was that of Gribouille. This very cute little Yorkie was abandoned a few weeks ago but was never going to have a long wait. He was small and cute and attracted lots of attention. Luckily for him he was adopted just before the real heat begins. Next weeks meteo shows temperatures soaring and extreme heat is very hard for our dogs. 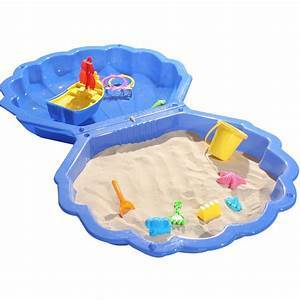 If anyone happens to have any paddling pools that are no longer needed we would really appreciate them. The dogs love to cool down in them and we would like as many dogs as possible to have access to one! Any pools would be most appreciated! Today, Danov, one of my favourite dogs was adopted! Danov arrived at the refuge at the beginning of February with his brother Bogdan. Both were happy, sociable dogs who were a delight to walk and very affectionate. It didn’t take long for Danov to be adopted, unfortunately that was short lived, and he was returned a couple of weeks later. The main reason for him being returned was that he could climb the garden fence and they family were not willing to heighten the fence. 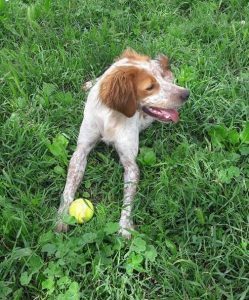 When adopting an active breed such as a Brittany spaniel, we try to ensure that adopters are realistic about their exercise needs. Young energetic spaniels need an active, training minded family who are willing to cater for their needs and if they are to be left in the garden, it must be secure. 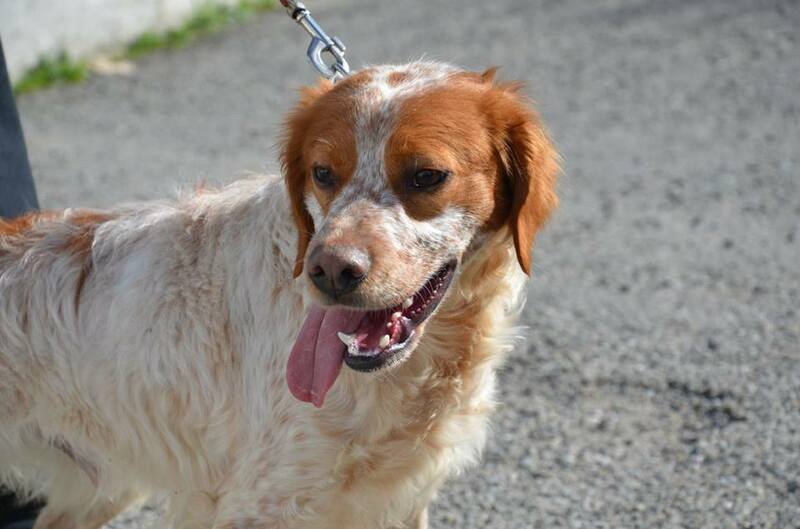 We do have quite a lot of Brittany spaniels at the refuge so Danov is lucky not to have had too long a wait. His brother Bogdan has had little interest shown and with the arrival of lots of spaniel pups, risks spending a long time in kennels. With the hot weather and summer holiday approaching adoptions are thin on the ground which means that we have a great choice of dogs for potential adopters. If you are thinking about getting a dog, do give us a call and we can advise you what dog would suit your lifestyle. We do know the background of lots of our dogs, especially the ones who have been abandoned. This means we can tell you what kind of family the dog is used to and what other humans and animals he has lived with. Some adopters take comfort in knowing the background and others really don’t care. It’s a personal choice and we are here to help either way! 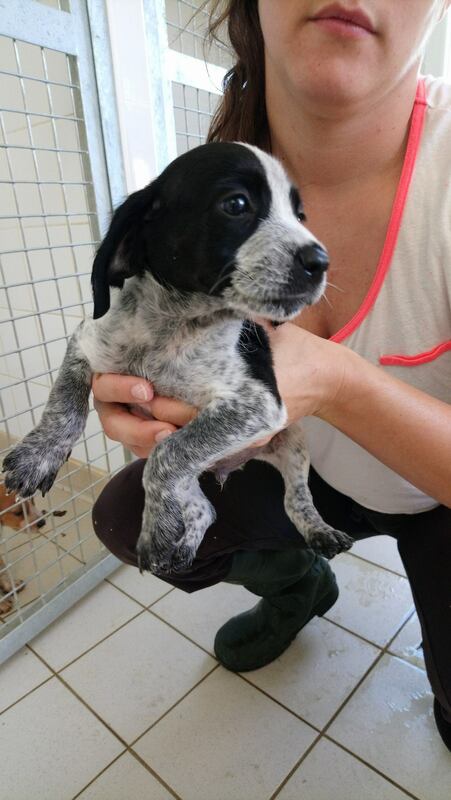 You can contact us by emailing website@dogrescuecarcassonne.co.uk or messaging us on our facebook page https://www.facebook.com/dogrescuecarcassonne/. 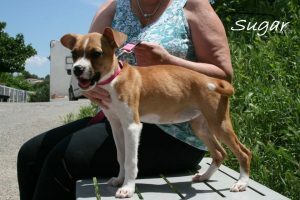 Today little Stewart the lovely little fox terrier was adopted. I really don’t know why it took such a long time for a small, cute, well-behaved boy to be adopted but maybe he was waiting for the perfect home! 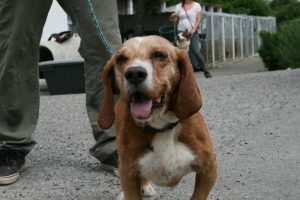 About 3 weeks ago we had an email enquiring about Stewart, but we already had a couple who were interested in him and had already arranged a visit. I replied saying that should the couple not take Stewart I would get right back to them. The couple didn’t take Stewart, so as promised I got right back in touch. An email later and I thought that I recognised the name. Mr Google confirmed that I was right, and it was none other than the real Peter May I was talking to! We had a nice chat and he and his wife arranged to come over to meet Stewart today.The meeting went well and after a nice walk, Peter and Janice decided they wanted to adopt him. As this is their first ever dog we chatted about what they could expect when they got Stewart home. With a first dog, adopters really do have no idea about what to expect, especially with a rescue dog. We covered housetraining, food, sleeping arrangements, exercise needs and lots more. Stewart was found roaming in a local village, he was hurt and bewildered when he arrived. Little did he know that with the ScPA’s tlc and our presence on social media he would soon be off to live with a celebrity! Of course, all of our dogs are not so lucky. Some have been waiting patiently for years. One of the best ways to help them and ensure that we can help more dogs, is of course fundraising. Peter has generously donated lots of signed editions of his books which we will feature in the next fund raising event. Stewart, adopted by Peter and Janice! Today was also a lucky day for pups Isaac, Newton, Sugar and Spice! None of these pups have had a long wait but we have LOTS more! If you are considering a pup then please get in touch and keep an eye on our facebook page. Isaac, now Charlie was the first pup to leave. Last but not least was puppy Newton!